Chili Cheese Fries. I have to admit what comes to mind first when I read this is french fries smothered in chili. But not these tasty fries that my family now wants me to make every night. 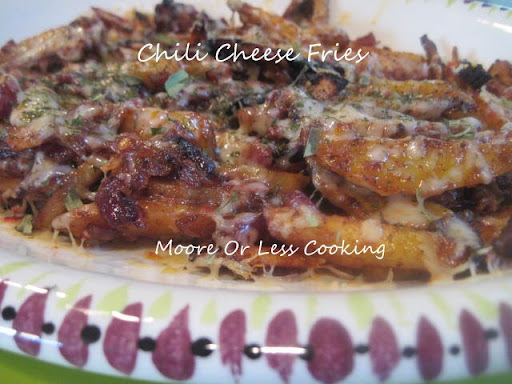 Yes I doubled the recipe and the vultures dove in and whoosh the plate of chili cheese fries had disappeared. I did one thing differently than the recipe stated, I added one red onion diced. So far all the Joy the Baker recipes that I have made have been wonderful and I have not been disappointed. Place a rack in the center of the oven and preheat oven to 425 degrees F. Line two baking sheets with parchment paper and spray with nonstick cooking spray. In a small bowl, whisk together cornstarch, chili powder, red pepper flakes, garlic powder, cumin, and ancho chili powder. Set aside. Rinse potatoes and peel with a vegetable peeler. You can leave some skin bits on the potatoes if you want to go for a more rustic fry. Using a sharp knife, slice a 1/4-inch piece off the potato lengthwise. This will give you a stable base to slice on. Rest the potato, cut side down, and slice potato into 1/4 to 3/8-inch planks. Stack planks in piles 2 to 3 planks high, and slice lengthwise into 1/4 to 3/8-inch strips. And… you just cut French fries!! In a medium bowl, toss the potato strips with olive oil, Worcestershire sauce, and grill seasoning or dry barbecue rub. Sprinkle the cornstarch mixture over the potato slices and use tongs to toss together, making sure that every potato is coated with a bit of cornstarch and seasoning. Spread potatoes in a single layer across the prepared baking sheets. Bake for 30 to 40 minutes, removing the potatoes from the oven 2 or 3 times during baking to toss them together. Cook until potatoes are cooked through and brought to your desired crispiness. Remove from the oven, top with cheese and return to the oven for just a few minutes to melt the cheese. Remove and place onto a platter. Sprinkle with chives and serve immediately. I don’t see an actual recipe for the chili cheese fries? ?